Liu Kang was born in the People's Republic of China, and was a descendant of Kung Lao, the Shaolin monk who was defeated by Goro five-hundred years ago. Liu Kang was a Shaolin monk himself, and a former member of the secret White Lotus Society. Through his entire life he had heard of the Mortal Kombat tournament, once a glorious event but now corrupted by Shang Tsung's evil. At the age of 24, he entered the tournament in the hopes of returning it to it's noble origins. Arriving at Shang's island, Liu Kang refused to be intimidated by the numerous skilled warriors that had gathered for the event. He defeated every opponent he faced and found himself squaring off against Goro, the half-human, half-dragon champion of Mortal Kombat. 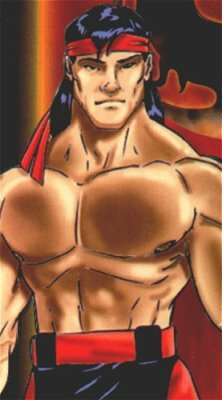 With his surprising speed and strength, Liu Kang defeated and presumably killed Goro in a spectacular battle. Surprised at Goro's defeat, Shang stood no chance and was himself defeated. The old sorcerer fled through a dimensional portal, and Liu Kang had succeeded in restoring the tournament's honor. Returning to the Shaolin temple, Liu Kang was met with a devastating sight. The temple lay in ruin, and every monk had been slaughtered. The attack was in retaliation for Kang's victory over Tsung, and had been led by Baraka. Learning that Shao Kahn, the leader of the Outworld who had ordered the attack, was hosting a second Mortal Kombat tournament, Liu Kang quickly entered to gain revenge. Traveling alongside friend and fellow Shaolin monk Kung Lao, Liu Kang journeyed into the Outworld. As before, Liu Kang breezed through the lesser challengers in the tournament. His disciplined fighting style was now fueled by pure rage, and he had also received limited training from Rayden. The results of the second tournament were almost identical to the first: Liu Kang defeated Goro's successor, Kintaro, and then Shao Kahn himself. Both he and Kung Lao realized that to kill Kahn would make them no better than him, and the two left the defeated emporer and returned to Earth. After several months, the fully recovered Shao Kahn finally achieved his dream of invading the Earth realm. Liu Kang found himself the prime target of Kahn's extermination squads, as he posed the biggest threat to Kahn's rule of the Earth. Eluding the squads, Liu Kang joined with Kung Lao and other Earth warriors to oppose the Outworld invaders. Under the guidance of Rayden, the warriors managed to push Kahn's armies back into the Outworld. During this time, he had met Kitana, the true heir to the throne of the Outworld. In exchange for her help in saving the Earth, Liu Kang offered to help Kitana gain control of the Outworld. Kung Lao had perished during the battles, and Liu Kang vowed to avenge his friend's death by ridding the world of Kahn's menace once and for all. He and Kitana managed to defeat Shao Kahn, and once again Kang's vengeance was satisfied. Before returning to Earth, he was personally thanked by Princess Kitana for his help in saving the Outworld. Liu Kang spent the next few years trying to rebuild his shattered life. One day, he received word that the Outworld had been invaded by Shinnok and Kitana was being held prisoner. He embarked on a one-man rescue mission, only to be repelled by Shinnok's forces. He sought the help of Rayden, who had become his mentor since they had met in the first Mortal Kombat tournament. He and Rayden gathered the mightiest of Earth's warriors to once again travel to the Outworld to end the threat of Shinnok.